Floors can look beautiful, but what lies beneath has to have been constructed and built to the South African National Standards. You really do not want your beautifully newly laid floor cracking up because the foundations are cracking, or the tiles lifting because of rising damp. The Application of the National Building Regulations that apply to floors (Part J of SANS 10400) are certainly not exhaustive. In fact, if you think of how much of our house is floor, it’s what we might, in South Africa, describe as a biekie min. But the authorities have, at least, increased this part of the document from a single page to nine pages (although these include a page of references to other SANS that need to be taken into account, and more than a page of definitions) plus a cover page, a Foreword, Contents page, an Annex that gives the official, legal Regulations (see below), a one-line Bibliography – on a full page, a couple of blank pages and some info about the SABS Standards Division. Like all the other parts of SANS 10400, Part J, Floors, has two sections. 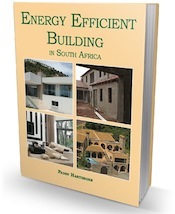 One section covers the Regulations (the National Building Regulations and Building Standards Act, 1977 and all its amendments) and the other covers how they should be applied (previously what fell under the “deemed-to-satisfy” rules). In terms of the Regulations (the law), there is one substantial change to the first general requirement that previously stated that any floor of a building must simply “be strong enough to safely supports its own weight and any loads to which it is likely to be subjected”. It now states that “any floor of any building shall be designed and constructed to safely support its owns weight and any actions which can reasonably be expected to occur and in such a manner that any local damage (including cracking), deformation or vibration do not compromise the efficient use of the building or the functioning of equipment supported by such a floor”. Floors must be fire resistant and where necessary, non-combustible. Floors of laundries, kitchens, shower-rooms, bathrooms and toilets (hooray, they are no longer referred to as WCs!) and urinals must be water resistant. Timber floors must have adequate under-floor ventilation. Concrete floors supported on ground or filling must be constructed in such a way that moisture will not penetrate the floor slab. As always, the Regulations state that these requirements will be “deemed to be satisfied” if the design and construction of the floor complies with this part of SANS 10400. However, if the local authority deems it necessary, certain other requirements may be needed. For instance the local authority may demand that the entire area within the foundation walls of any building be covered by a suitable damp-proof membrane, and in the case of a basement, or semi-basement, they may require adequate sub-soil drains to be provided under the floor to drain and therefore remove any water that accumulates. So if you’re not sure of anything that relates to floors and flooring, approach your local authority for guidance. They are obliged to help you. 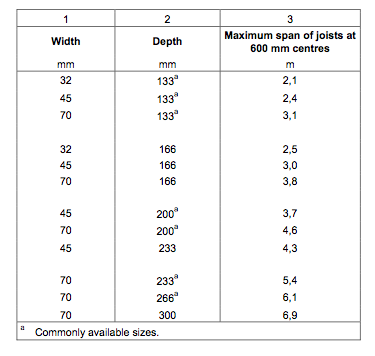 In addition to a number of SANS that relate to building materials including boards, timber, concrete and fire testing of materials, the SANS states that Parts A (general principles), B (structural design), H (foundations), T (fire protection) and V (space heating) of SANS 10400 must also be taken into account when constructing floors. There are some useful drawings that show how suspended timber floors should be built. A competent person (civil engineering) shall design and inspect fills where the maximum height of fill beneath floors, measured at any point, exceeds 400 mm. Flooring boards that must comply with SANS 629 and amongst other things should have a face-side width of at least 50 mm and not more than 140 mm, and tongued on one edge and grooved on the other, with square-sqwn or end-matched ends; and have tongues and grooves that produce a tight-sliding fit, and a flush joint on the face-side of the boards. 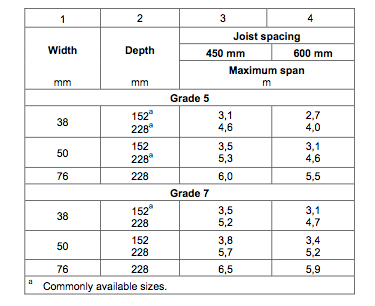 Strip flooring that amongst other things should have a width between 35 mm and 90 mm and a nominal length of at least 460 mm (and tongues and grooves as above). Particle board that should comply with SANS 50312 and SANS 1931. Composite and plywood that should comply with SANS 929. 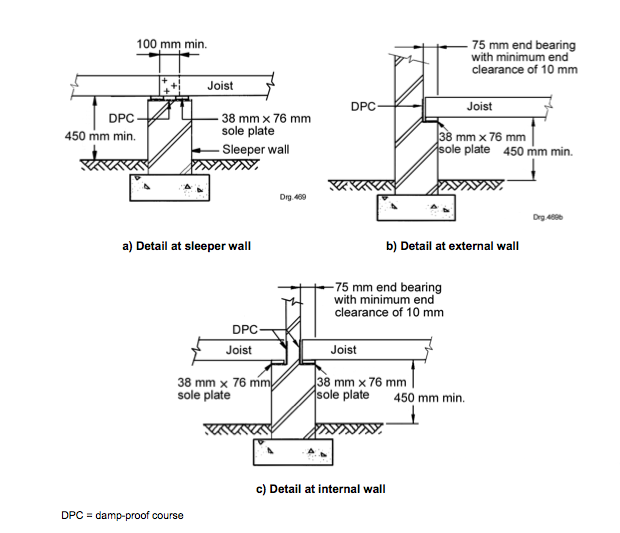 Additional guidelines relating to suspended wooden floors relate to the clearance between the joints and ground; ventilation; metal masonry anchors to be used and so on. There are also a number of guidelines given for floors that are supported on ground or filling, but it is also stated that this type of floor should be designed and constructed in accordance with the requirements of SANS 10109-1 under the direction of a competent person (civil engineering) unless the building is to be used for storage or industrial purposes, in which case different guidelines are given. This section also gives guidelines for underfloor membranes and filling beneath floors. Apart from anything else, a competent person (civil engineering) “shall design and inspect fills where the maximum height of fill beneath floors, measured at any point, exceeds 400 mm”. So even if you go the DIY route, you’re going to need professional assistance. Unfortunately we are not able to help. Plascon Paints has epoxy flooring products; perhaps they can help. I have a house built by Garden Cities. My snag list had hollow tiles mentioned – numerous were located. I was told that hollow tiles were not a problem but should a problem arise in the future they would deal with it – unfortunately only verbal. 5 1/2 years later a large section of my open plan area has now lifted and the developer says its not their problem. Is there anything I can do? Other than sue them, no. Never accept verbal assurances – and if you are worried about something get a second opinion. If the tiles sound hollow, they probably laid them using blobs of tile adhesive or mortar which is a common cause of tiles cracking. The entire under-surface of tiles must always be covered. I bought a house which was 5-6years old. About half the tiles in the living area sounded hollow to a tap; in some places the grout was breaking up as well. Tile tiles in other areas were fixed well eg on the stairs.I was advised to have all the tiles lifted and have the living area retiled. Though the tiles were quite thin (cheaper quality),about a third of the tiles lifted were not broken and had no chunks of cement sticking to the back. Could you tell me why the tiles in a relatively new house can become loose like that? Hi Uda, This is due to bad workmanship. This seems like the tiler skimped on tile adhesive and did not put adhesive over the full underside of the tile but used the 5 spot method – a spot of adhesive on the 4 corners and one in the middle leaving gaps in between. That is why you can hear hollow taps. This is never reccomended as the tiles can crack and lift over time. Thank you for coming back to me. The tiles that was lifted in one piece, had cement stripes/ markings on the back. The tiler must have “combed” the cement and then laid the tiles, not the spot method, but after about 5 years the cement just did not keep holding on to the tiles!? No chunks of cement stuck to the tiles. Hi Uda, Well all I can say is that the tiler must have used really cheap tile adhesive. That is not right for them to lift after only 5 years. we are wanting to lay a 7m x 7m concrete slab separate to the house as a base for a braai area (No walls and no roof). There is no electrical or plumbing requirements. Are we required to have plans made for it? we bought vinyl wooden floor and had it installed with under floor heating, within a month the vinyl started bubbling up, we called the company and told them to fix the floor, they uplifted the entire flooring and the heating, after several specialist coming to check, they realized that there is moisture underneath. now we need to know if we can force them to fix the floor, we have decided to put porcelain tiles instead, can we force them to buy the porcelain tiles and install as we have paid over R28000 for the vinyl and cannot really use it due to the moisture in the bedrooms. did they have the responsibility to check before installing that the floor was suitable for the wooden vinyl floor?